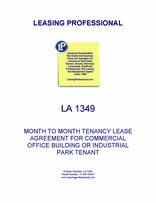 This lease is for a month to month tenancy for a commercial tenant in either an office building or an industrial park. The rent is specified on a monthly basis, and either party can terminate the tenancy with at least thirty days written notice to the other. The tenant must post a security deposit, and provide commercial liability insurance. Apart from that, the lease is gross, meaning that the landlord is responsible for real estate taxes and other charges. The landlord provides services comparable to those furnished to other tenants in the building. 1. HIRING OF PREMISES: Landlord leases to Tenant and Tenant hires from Landlord on a month to month basis, the premises described as: ___________________________ on the terms and conditions set forth herein. A. DESCRIPTION OF PREMISES: Approximately ________ rentable square feet on the ____ floor in the building (“Building”) commonly known as ________________________. The premises are outlined on Exhibit “A” attached hereto and made a part hereof. B. TERM: Month to month, commencing _________. This Agreement creates a tenancy from month to month. Either party may terminate this Agreement by giving at least thirty (30) days prior written notice thereof to the other at any time. The rent shall be due and payable through and including the date of termination. C. RENT: The initial monthly rent shall be $______________, due and payable upon execution of this Agreement. Rent shall be payable in monthly installments in advance on the first day of each month. Unless otherwise instructed by Landlord, Tenant shall pay rent to COMMERCIAL LANDLORD, LLC, as Landlord, at Landlord’s address as provided by written notice to Tenant. All monetary obligations of Tenant to Landlord under the terms of this Agreement (except the Security Deposit) are deemed to be rent. D. SECURITY DEPOSIT: $_____________ due and payable upon execution of this Agreement. E. USE OF PREMISES: General office use and other related legal uses. F. SERVICES TO BE PROVIDED BY LANDLORD: All building services normally provided by Landlord to tenants of comparable premises in _________ Business Park during regular business hours, Monday through Friday (except recognized holidays), including utilities, janitorial service, and heating, ventilating and air conditioning, but not including electricity for large computers, electric space heaters, or other special equipment such as supplemental HVAC or security system coverage. G. REMOVAL OF PROPERTY: At any time Tenant may, and prior to the termination of this Agreement Tenant shall, remove from the premises furniture, equipment, and other personal property installed by Tenant or at Tenant’s expense. Tenant shall not remove any fixtures or leasehold improvements without Landlord’s prior written consent. Tenant shall repair any damage to the premises caused by removal of any property, and shall restore the premises to its condition at the commencement of the tenancy, less reasonable wear and tear. All of such removal and restoration shall be accomplished at Tenant’s expense prior to the termination of this Agreement. H. TENANT’S INSURANCE: A commercial general liability policy: $2,000,000.00 limit per occurrence is to be provided to Landlord prior to occupancy. Landlord is to be listed as “Additional Insured” and “Certificate Holder” on the policy as follows: COMMERCIAL LANDLORD, LLC. Tenant is only required to add/list these Premises to their existing Commercial general liability policy, providing Landlord with a ‘revised’ policy within thirty (30) days. I. TAXES: Landlord shall pay all real property taxes upon the leased premises. J. PARKING: Tenant shall have the right to use at no additional cost to Tenant, Tenant’s pro-rata share of parking spaces which is equal to _______ (__) unreserved on-site vehicular parking spaces, unmarked surface spaces, on a non-exclusive basis, located in the parking area of the Building. L. CONDITION OF PREMISES: AS IS. 2. RENT: Tenant shall pay to Landlord the rent specified in paragraph 1 hereof in monthly installments in advance on the first day of each month. Landlord reserves the right to increase the rent upon thirty (30) days prior written notice to Tenant. Tenant agrees to pay the rent to Landlord in lawful money of the United States of America, without deduction or offset. Rent for partial months shall be prorated based on a thirty (30) day basis. 3. SECURITY DEPOSIT: Upon the execution of this Agreement, Tenant will pay to Landlord as a security deposit the sum specified as “Security Deposit” in paragraph 1 hereof. If Tenant shall pay the rent and observe and perform all of the terms, covenants, and conditions of this Agreement through the termination hereof, Landlord will repay the Security Deposit to Tenant without interest, within thirty (30) days after Tenant vacates the premises. Landlord shall not be required to keep the Deposit separate from Landlord’s general accounts. If Tenant defaults in the payment of rent, damages the premises, fails to leave the premises in broom clean condition upon termination of the tenancy as otherwise provided in this Agreement, including without limitation in paragraph G of paragraph 1 and in paragraph 8 hereof, or defaults in any of the other terms, covenants, or conditions of this Agreement, Landlord may use or apply so much of the security deposit as is reasonably necessary to remedy such default. Tenant agrees to restore the security deposit to the full original amount immediately upon receipt of demand from Landlord therefor. 4. POSSESSION: If Landlord is unable to deliver possession of the premises to Tenant at the commencement of the tenancy for any reason whatsoever, this Agreement shall not be void or voidable for a period of thirty (30) days thereafter, nor shall Landlord be liable to Tenant for any loss or damage resulting therefrom, but the rent shall abate (and/or be pro-rated to available square footage) until Landlord delivers possession of the premises to Tenant. If Landlord is unable to deliver possession of the premises to Tenant within thirty (30) days after the commencement of the tenancy referred to in paragraph B of paragraph 1 hereof, this Agreement may be terminated by either Landlord or Tenant by written notice to the other at any time thereafter prior to the date possession is delivered to Tenant. In the event this Agreement is terminated pursuant to the foregoing provision, Landlord shall refund to Tenant the initial monthly rent and the Security Deposit received from Tenant, without interest. 5. USE: The premises shall be used for the purposes specified in paragraph E of paragraph 1 hereof, and for no other purpose without the prior written consent of Landlord.